It has been a catching up sort of a day! Catching up on rest, sleep, and some of my online places. The boys did catching up too – on sleep and more sleep! 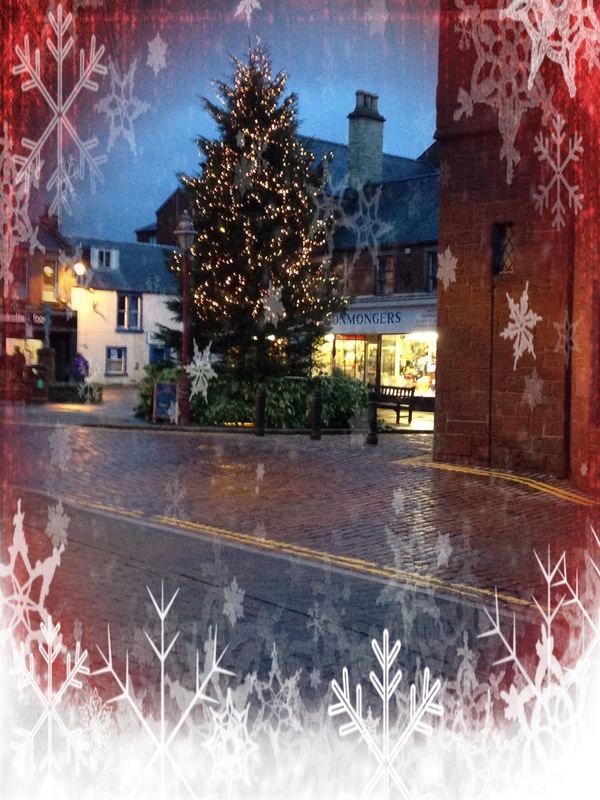 The Town Christmas tree lit up just before Christmas … ahhh bonny! Tomorrow I will do a calendar of 2013 with my 12 favourite photos and look forward to 2014 – going from Serenity to Successful … if any readers are One Little Word (OLW) people would love to see what your words are for the coming year – why not leave a comment? Hello … we (that is me and the boys) were delivered safely home at 11:30 today. It was a stressful morning and since we arrived home the boys having checked out their garden have slept; taking 10 minutes to eat their tea and scout outside again. They have not slept for 10 hours at a time for the whole of last week! We were aiming to start out no later than 09:00 and at 07:45 I went to get dressed and shove the last couple of things in my packing. The boys were in the company of Moo and Mother in the kitchen. I had only been 5 minutes and was half way through my face when hell broke loose! Mother screamed into the lounge followed by the three dogs and berated Daddy because she was left alone with these terribly disobedient dogs (those will be the ones sitting up watching her shove food into a bag for me to bring home). So I stopped getting ready and went to supervise the dogs in the lounge because Daddy was been sent on an errand out to the car. Fifteen minutes later I was able to finish my face then get the dogs into the car. Loading took a few more minutes and at 08:20 I was in the car waiting to go. Ten minutes later we were off. Dog was better on this journey – much less crying and woofing and wee man just lay down. I had had a really strange feeling about leaving the house this time – sufficiently strong to take important paperwork with me for safety! Anyway all was fine when we returned and once the car was unloaded the boys settled right in at home. My backpack is unpacked and tomorrow I can do laundry and some shopping oh and book the wee man in for his jags. But first … sleep! I have only had one interrupted night in 7 days and even that was only six hours … my electric blanket is making my bed cosy and familiar and in just a moment the boys are going out for bed time pees and then to their bed … sweet dreams everyone. Best laid plans of mice and men apparently don’t apply to mothers! You may recall I was anticipating a beach trip today and lots of photographs … here’s what actually happened! First off I did get a nights sleep – my first in a week. Second off the Cairn had to go to the vet first thing for a staple in her wound – so everything got delayed. We got to the town and had agreed to pop into a big department store – I had a rather generous gift card from there as a Christmas present and a national paper was running an offer for a few days which made that voucher worth120%. We got out of the car and as we walked to the store Mother says “I don’t think we will do the beach today it is too cold … don’t you think?” well actually I didn’t and I said so. We got back to the car and Daddy asked where to next … Mother said she had nothing else to do and I said neither had I and it would have been left there except Daddy then asked why we needed dog towels with us. I said we were going to the beach but it was okay I would walk the dogs when we got back to the house so he over ruled Mother. 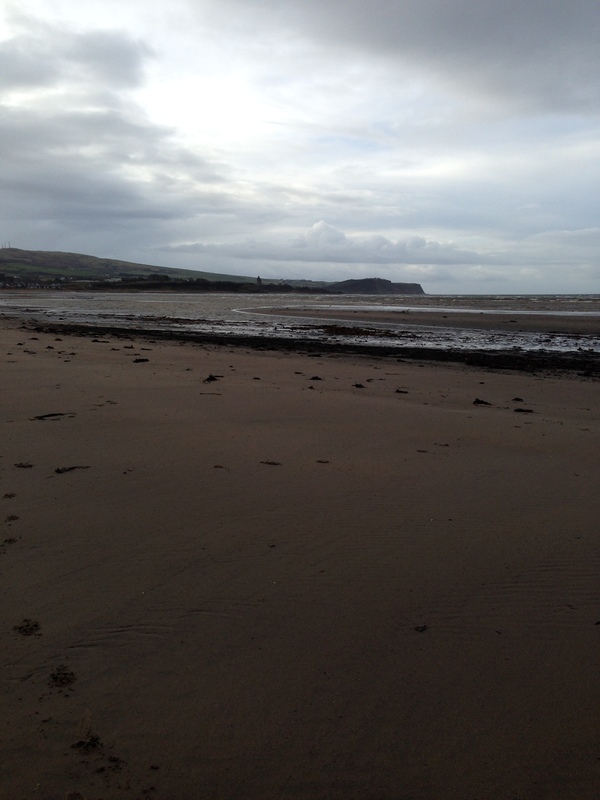 I took the boys on a lovely beach in the roaring wind – it was what the wee man needed. He normally covers around 25 miles a week and had done about 1 mile this week – no wonder he is behaving stir crazy with one of the other dogs? 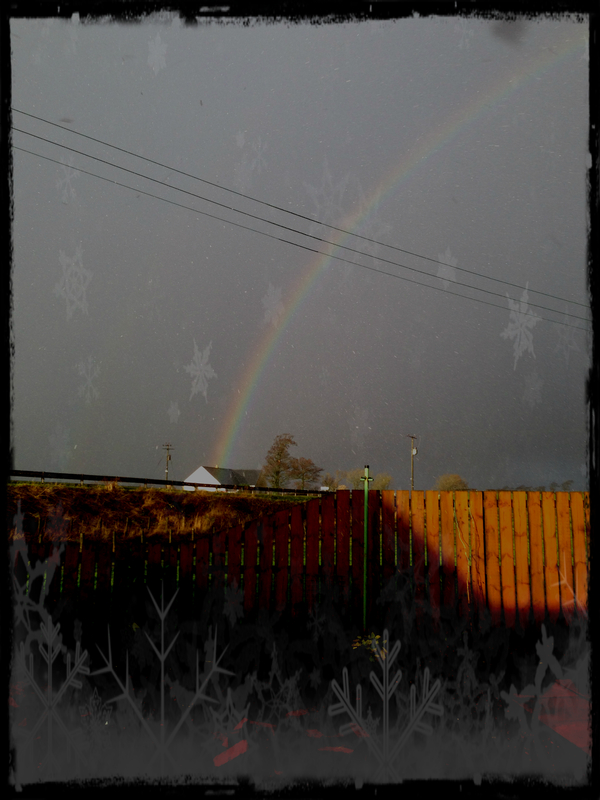 It really was snowing and hailing as that appeared – really strange. 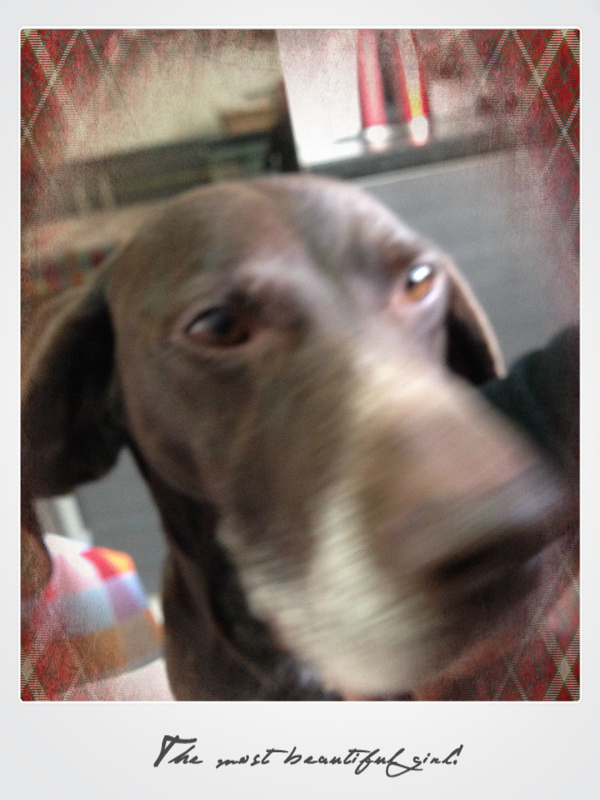 Yes it is blurry … but I will miss Moo when we go home tomorrow. I have spent the evening being quizzed about food items I could take home with me … how many ways can I say “I do not eat refined carbs and especially sugar”? My wee (not so much now) man has found a new friend in my parents cairn terrier. 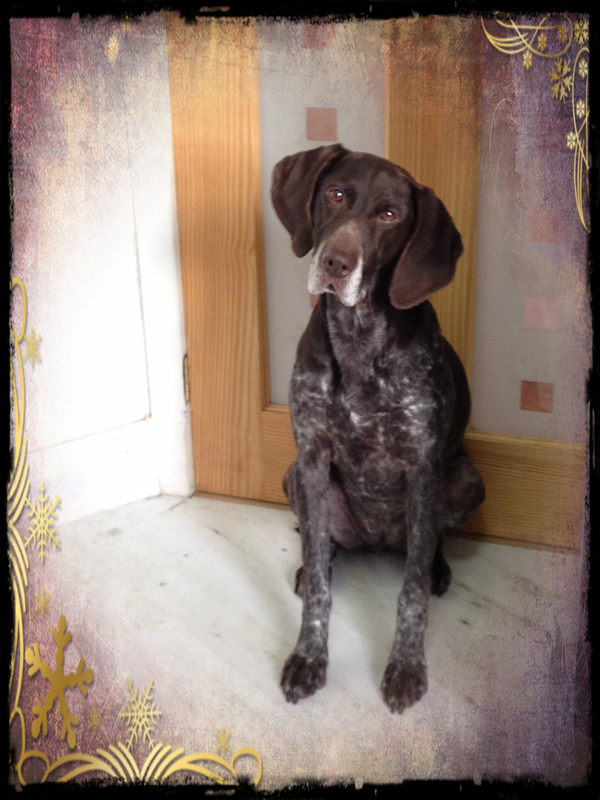 She can be grumpy with other dogs but she seems to have taken a shine to Pup (unlike another member of her pack – Pup’s dad is not keen on this teenager who is bigger than him and more dominant). 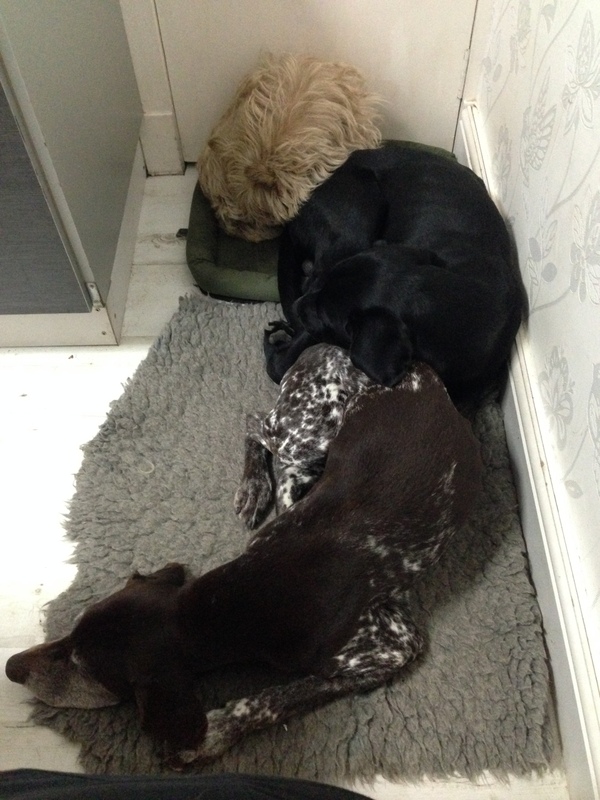 The cairn allows Pup to spread onto her bed during the day and then this evening one of the others told Pup off and the Cairn stood between them and told the other dog to leave Pup alone. Just now at bedtime I was talking to the cairn and another (my two are both tucked up in their beds) and the cairn cried. When I looked I could see she had a wound on her shoulder. We have trimmed the hair away and in the morning she will be off to the vets for a check and some stitches. We think we know who has inflicted the wound and I am pleased to say it is definitely neither of mine. Hopefully later tomorrow my two are going for a romp on the beach – the weather is supposed to be calm and almost balmy! am also supposed to be taking photos of Pup’s wee sister and she is wee compared to my tall lanky lad. So fingers crossed you can get photos tomorrow … until then here are my boys cosied up with the cairn. 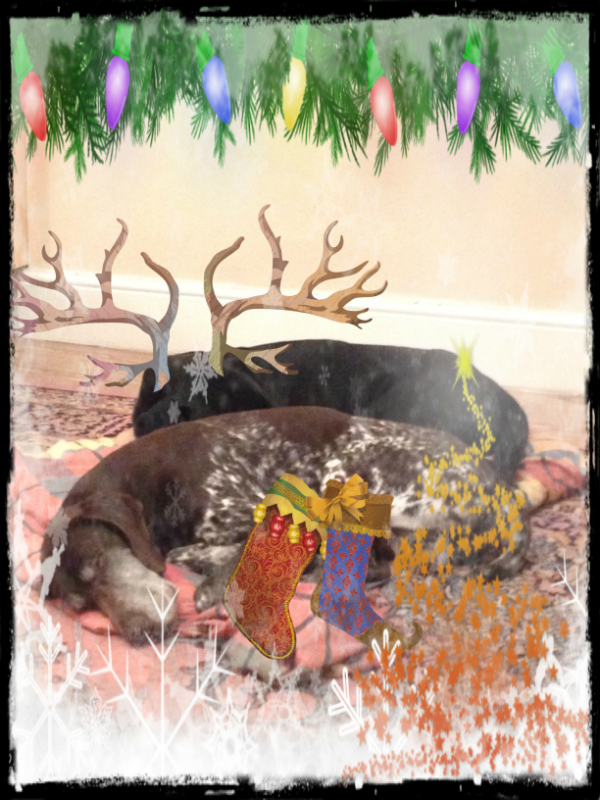 The dogs are not the only bickering squabblers … so looking forward to my own style of peace and quiet next week! I had a surprise greeting earlier from South Africa; I got to have a little mooch round Tesco … and then I cooked the veggies and rice put out the cold cuts and a salad. At least it cannot be said I haven’t made myself useful. Now I am just waiting for the room to cool before I settle to sleep (the heating has been on all day again because one person was chilly). … with a Ho Ho Ho here and a Ho Ho Ho there … as we approach the end of 2013 my financial situation is what might be termed static and so I am resorting to e-Cards and messages on my Social Media to spread my seasonal good wishes to all. 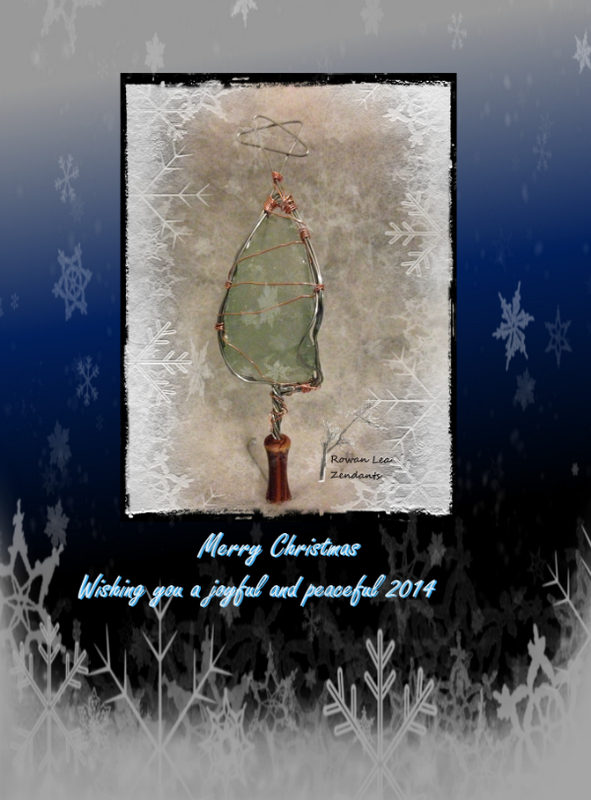 However the e-Card is still a bespoke handmade one featuring a wire wrapped seaglass ornament. 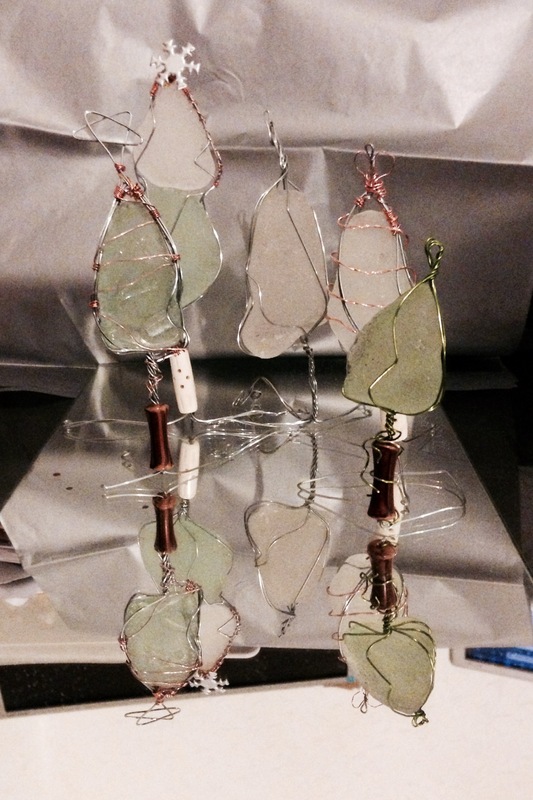 I have only made one gift this year and it is a set of five different seaglass Christmas trees – so I made it do twice the work and featured it for my card too. However breaking news tells me that I am not the only one making cutbacks … in a shock revelation it turns out that Santa has had to make the reindeer redundant. A spokesperson at the North Pole attributed the cutbacks to the appallingly wet and windy weather and the ice storms which are causing a global transport slow down for Christmas. Fortunately some replacements have been found. We caught up with these compact reindeer imposters as they rested before their global mission and as we can see they are hopeful of being rewarded with socks full of biscuits! To all my friends wishing you the warmest Christmas filled with the love of friends and family and peace for our battered world.